Under the auspices of Prof. Ezzat Hassan, the Dean of the faculty Allied Medical Sciences and Prof. Mervat Osman, the Vice Dean and the Head of the Scientific Committee, the second scientific conference was held on Tuesday 26/3/2019. The first session of the conference was given by Prof. Esam Ghonem, the Head of the Nutrition Department where he gave a lecture about the importance of healthy nutrition for cancer patients. On the one hand, he cast light on the health problems that people with cancer suffered from as a consequence of the changes occurred to their bodies due to chemical therapy. Prof. Esam Ghonem also discussed the nutritional problems that people with cancer are racked with on the other hand; loss of appetite, nausea, vomiting, diarrhea, constipation, oral pain, and trouble and agony in swallowing. Then, he added that the nutritional system is an important aspect of cancer treatment and eating appropriate types of food before, during and after the treatment helps the patient to feel better and retain strength. The patient must have enough amounts of food that contain essential elements such as vitamins, minerals, proteins, carbohydrates, fats and water to achieve proper nutrition. The second session of the conference was given by Mr. Abdelrahman Mekky, an Assistant Lecturer at the Medical Equipment Department, talked about the numbers of people with special needs, amputees and elderly people with mobility difficulties that increased considerably in the last decades. These are considered as victims of different factors; road and factory accidents, some genetic predisposition or diseases which eventually resulted in difficulties in movement and doing everyday tasks. Thus, it was necessary to employ the huge technological development in the field of manufacturing artificial limbs, not the traditional approaches to help these victims. He also explained the latest advances in medical engineering in the field of the manufacturing smart artificial limbs. He also provided a simplified explanation of the system that connects computers with neurons and the technique of linking them. The third session of the conference was delivered by Mr. Ahmed El Deriny, an assistant lecturer at the Medical Equipment Department, who spoke about the Positron Emission Tomography “PET” which is an imaging technique in nuclear medicine that shows three-dimensional images of some organs that may be afflicted with a cancerous tumor or metastatic cancerous cells. He then explained the mechanism of the PET equipment and how it can be used to check the physiological processes of the body. 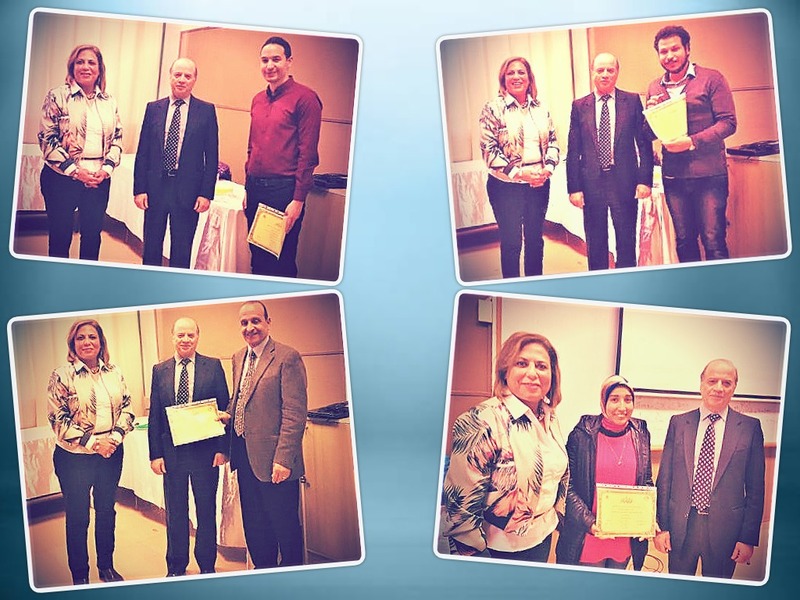 At the end of this conference, Prof. Ezzat Hassan, the Dean of the Faculty and Prof. Mervat Osman, the Vice Dean and the Head of scientific committee distributed certificates of appreciation among the conference researchers as well as the student Hagar Fathy Youssef for her exceptional academic standard in conducting research projects.